This will be my last update. Next up to-be-read: None. 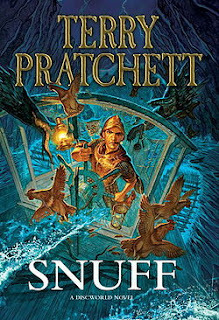 Just started reading Snuff, and it will last a while! I had planned to read the second book in the Hitchhiker's Guide to the Galaxy series at the end, so that I could enjoy myself and it would be a light, entertaining read. Still, when I finally got to that moment when I was tired and ready to read what would be my last book of the readathon, I was quite in a mood for some Discworld magic. I can read a Discworld book even in my sleep and I managed to get my hands on this one. Well, wish me happy reading. Hope you had a lot of fun! Why is this your last update? Are you heading off to bed? ...because if I stay online any more, I'll keep putting off the reading and visit other blogs and take part in mini-challenges, and later maybe even accidentally fall asleep.. I'll come back to post one grand wrap-up post!! I did exactly that - went offline for 12 hours - got two books and several hours of sleep done!